Submitted by Jeff Buster on Thu, 06/13/2013 - 21:08. These were the visual impressions. However, the olfactory impressions were much stronger. There is no polite way to say it - about the strongest fetid stench I have experienced made the end of the subway car unbearable to occupy....people were holding their noses and leaving the car at each platform. Except not everybody left the car. I think people were overpowered nasally and emotionally...the only person that actually did anything was a gay man who got up from the seat next to me, getting out a 10 dollar bill from his wallet, went over to the sick fellow, and pushed the bill gently into the fellow's hand. 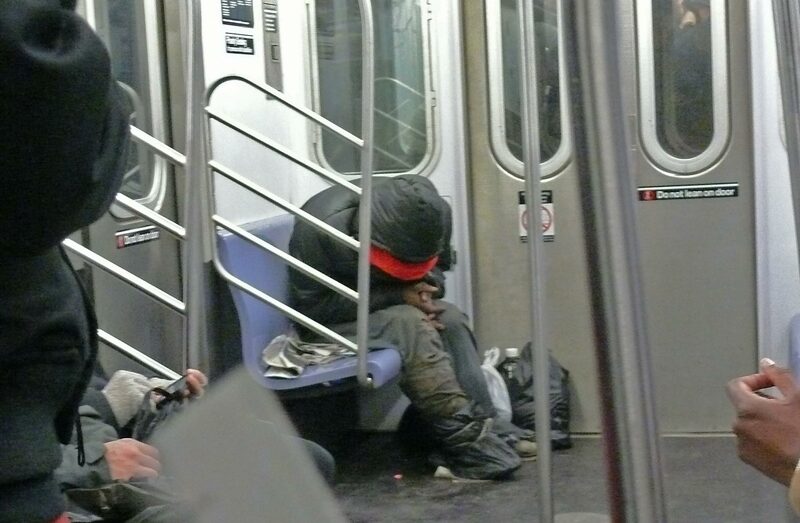 Could the transit police or some other service get the sick person off the subway and to a hospital? What if the fellow didn't want to get off? Was the smell a reason to remove the person? How cruel to take a guy out of a public place because he is so sick and his flesh is rotting and smelling. When I got off the subway it was just after dusk and I could see the new Freedom Tower being topped out at 1776 feet high. I thought - "Man builds a structure way up into the sky - no problem - but we can't figure out how to pragmatically and humanely help a sick fellow human - get him from a bench on the subway to medical and emotional and financial help....this very seriously ill fellow was rotting away before my eyes...I wrote down the subway car's four digit number...who would I provide the number too?" We are all so weak. It took me months just to get up the strength to write about the experience - definitely the most powerful and memorable experience of my visit to New York City. Submitted by Gone Fishin on Thu, 06/13/2013 - 23:46. Submitted by ANGELnWard14 on Sat, 06/22/2013 - 00:36. This type of status is definitely not a single incident...........sad; but true. Who is to judge? Who is to help? Who is to say what is right for them? Submitted by lmcshane on Sun, 03/24/2019 - 10:15. WHEN did this situation become so dysfunctional? Who created this evil? Applewood Centers used to be an option for "orphan" children - now, that system either incarcerates the children or farms them out to foster care. Parents have to endure nightmare separation from their kids and sessions with Ohio Guidestone counselors, before the system deems them worthy of having their kids back. For folks with drug or alcohol addiction - the only option for transitional care is http://kissfoundation.com/ - a supportive environment that does not ACCEPT ANY FEDERAL, STATE or LOCAL dollars to avoid the arcane regulations that come with this money, and that also pays property tax in the City of Cleveland. Because it is the only program of this kind - men are referred to it from as far away as Youngstown OH. This is UNREAL. Because of where I work - I see the people caught up in the nightmare that has become Health and Human Services in Cuyahoga County. BUILDING so-called HOUSING FIRST projects is NOT addressing a NEED or a service to families in crisis. IT is just creating an opportunity to squander federal, state and local monies and provide kick-backs to construction contractors and the extensive BLOATED HHS NGOs that operate in Cuyahoga County. Since you are outside Cleveland, I am hoping you might expose the situation with Housing First fraud, no doubt occurring at a national level, but probably honed to an insane degree here in corrupt CLE-CUY. ADAMHSCC part of this equation - but I think it warrants research. This system guarantees a LOT of money to developers, CDCs, architecture firms and contractors and, of course, to CHN-Eden. Please see my attached post from REALNEO.us. I know individuals who currently work at the Emerald Alliance facilities in Cleveland. On a daily basis, I interact with PSH inmates, many who are young, drugged and/or mentally ill and living at the South Pointe facility adjacent to Metrohealth. These are primarily young, black men who have no place to go after they are released from detention or prison. Eden fast tracks these "children" by funneling them through the men's homeless center (this happens w/women, too) while expediting their SSI and Section 8 paper work to pay for their PSH "housing." This allows CHN-Eden (and now Front Steps) to place them in PSH. When they get their unit in South Pointe or any one of the PSH holding facilities - they may come and go. They may drink, smoke and continue to buy/sell drugs. The facilities have on-site services by Front Line, but their participation is voluntary. The residents of these units basically become wards of the state for LIFE. It is also sickening that Ohio Housing Finance Agency has NOW funded -three of these facilities along W 25 St. : Front Steps (next to a daycare), Southpointe (next to Metrohealth) and the proposed CHN-Eden Emerald Alliance XI (which is too close to two K-8 schools and the Cleveland Metroparks Zoo). All of these facilities are concentrated within a three mile radius. The model has to change from warehousing these individuals for LIFE w/o help- to instead - FREE transitional housing with treatment, recovery and a reentry program. Jeff, it is very sad that in Cleveland and Cuyahoga County - these individuals are seen as a cash value - and not provided real medical treatment and counseling. The system just exploits the mentally ill and "homeless." Transitional housing would put people on a course towards self-reliance and self-sufficiency, but that is not the goal of "Housing First" which seeks to milk every dollars out of homeless individuals. Front Steps was started by a religious order as transitional housing for women only, but now they are forced to join the EDEN PSH model. EDEN is a racket - as has been documented extensively by REALNEO reporter - Mabeldog- Cleveland Housing Network is out as their preferred partner on these applications - Front Steps is in. Joe Cimperman and Kerry McCormack under guise of Ohio City CDO with Tom McNair -have been working to move the Front Steps organization AWAY from Ohio City to get their hands on this valuable real estate. Front Steps will be constructing a NEW building - across from LJ Minor/Nestle and out of Ohio City - into the Tremont/Clark Metro area. St.Joseph's Commons is a housing tax credit supportive housing development that involves the new construction of a four-story, 68 unit building located in Cleveland, Cuyahoga County. Eighteen units will be affordable to households at 30% AMGI,23 units will be affordable to households at 50% AMGI,and 27 units will be affordable to households at 60% AMGI. Sixty units will have rental subsidy. The additional eight units are expected to have subsidyfinalized before being placed in service. The project was evaluated as part of the Service EnrichedHousing Pool. It was selected for its first priority designation by the Cleveland/Cuyahoga County Continuum of Care. St.Joseph's Commons will be located less than one mile from Lutheran Hospital-Cleveland Clinic and Rite Aid Pharmacy. Submitted by lmcshane on Sun, 03/24/2019 - 10:52. You asked who created this nightmare. The answer is the Ohio state legislators aka the lawmakers of Ohio. In Ohio the Ohio Revised Code states that if a mother lands in a domestic violence shelter with her children that the shelter is required by law to file a mandatory Report with Department of Children and Family Services. DCF is then required to come and investigate the circumstances. All of this violates the violence against women's Act which funds many programs. The Ohio Revised Code goes on to give Department of Children and Family Services or the public Children Service Agency the authority to petition the court for temporary emergency custody because the family is homeless or destabilize from the domestic violence. In addition to this Ohio Revised Code and Powers DCF to file child endangerment charges against the mother or victim of the domestic violence who is trying to protect the children. It is used as another way of human trafficking that violates HIPAA, the violence against women's Act, all Nationwide best practices for providing safety two victims of domestic violence and children, and interferes with custodial rights of parents, and it results in state-created harm subjecting children to further trauma. There is absolutely no excuse that Ohio thrives off of this debacle of laws that provides yet another Lane for DCF and public children service agencies to destroy families. It is absolutely unconscionable for state legislators to promote this kind of toxic legislation. As all of the public children service agencies and domestic violence shelters are co-dependent on federal funding oh, this is just another method of human trafficking. Victims of domestic violence literally get railroaded and put up against the wall with the threats of losing their children for seeking help and protection. This is why so many Ohio victims of domestic violence eat s*** and Romaine and domestic violence environments because they become trapped by law with Nowhere to Run. I have heard victim after victim recite how caseworker threatened to take their children under the color of Law and file petitions What's juvenile court to seek custody of their children as a result of them being involved in the domestic violence altercation their partners. so I am to understand that if a woman has an altercation with her baby daddy and the police are involved then DCF will come in and steal the kids in order to protect the children well subjecting a mother to Reckless interference and harm under the colors of law? every citizen in the state of Ohio should begin to recognize how they are used as pawns by people like Senator Sherrod Brown who was an expert on domestic violence as has a history of being a perpetrator. until our legislators eradicate illegal laws that contradict federal laws oh, our citizens rate will continue to be violated and the public servants AKA bad State actors will continue to use them as Pawns under false pretenses the violate their constitutional rights. railroading ignorant uneducated families in this method is absolutely unconscionable. It is destructive to the people. And more than anything it results in state-created harmed by DCF recommending custody to perpetrators in many cases. The system is broken Beyond repair. stop funding Cuyahoga County Fraud upon the public. File false claims act violations against every agency for failing the public. It is nothing more than habitual fraud by public servants and abuse of discretion by public servants that destroys the fabric of the community. ACT LIKE AMERICANS....NOT LIKE WASTED SPACE!